The China Town that really isn’t! I’m not going to hide the fact that we’ve found Lyon pretty dull. As cities go it is really regimented in its opening times and nearly everything is shut after 9pm and on a Sunday. 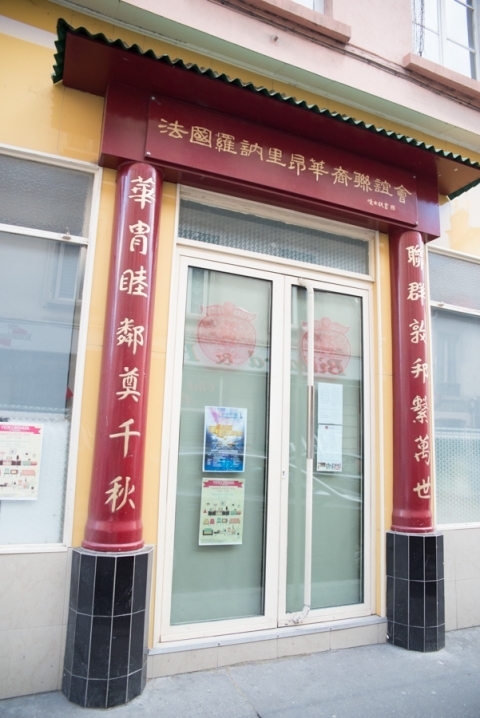 It hasn’t made life the easiest so when I read this article showing that Lyon had an actual China Town with an anticipated door like the one below, I got a bit excited. I really shouldn’t have. Lyon’s china town or ‘quartier Chinois‘ in French, comprises of just a few streets with Chinese and Chinese-Vietnamese restaurants scattered around. In fact this map shows you just how small it is. I never found the Chinese gate, in fact this door below was probably the most interesting bit of architecture I found!! 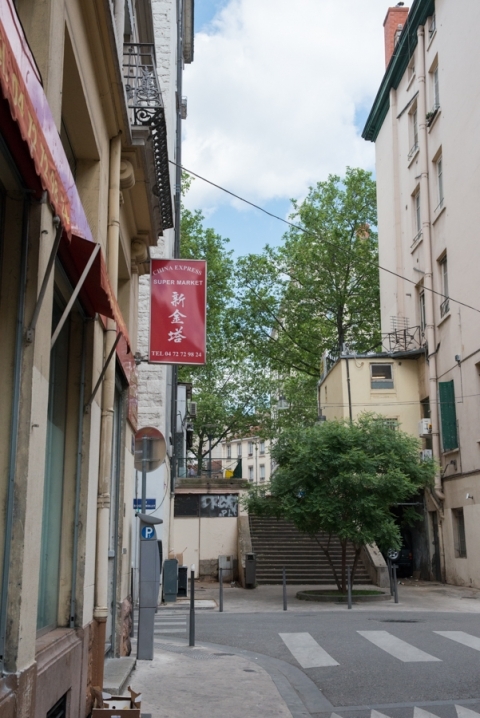 The area in which China Town is situated is the 7th arrondisement of Lyon and in parts it is quite disheveled. It is a hotch-potch mixture of Arabic and Chinese shops with some French phone shops and cheap perfume shops thrown in for good measure. The streets are not in good condition, there’s lots of dog poo (a big problem in France) and broken glass around. Watch where you’re standing! Whilst there is parking, it is hard to find and it is all paying. We managed to find a spot on Cours Gambetta and walk down onto Rue Passeret. As we were were walking through a connecting alley-steps there was a strong stench of urine which was particularly unpleasant. The alley-steps is shown in the photo below. The metro station of Guillotiere is quite close by however upon exiting you are met by a huge number of groups of Arabic men. Whilst their behaviour is not threatening or aggressive in any way, they are incredibly loud and this can be quite intimidating. The restaurants themselves are not a huge amount to write home about. As vegans we have struggled to eat anywhere in Lyon and China Town was no exception. There were a few vegetable dishes on the menu but only, say, 5 / 90 dishes offered. The food, in my opinion, that we saw served looked gelatinous and given the huge bags of MSG that were sold in the supermarkets, I would say they’re probably in all dishes. I didn’t try any of the food because I find French-Chinese cuisine VERY bland. The French are not particularly adventurous when it comes to oriental flavours and because of this Chinese dishes are ‘watered down’ and taste very ordinary. Whilst I was very disappointed with the quality of restaurants, I found a number of Asian supermarkets and for the FIRST time since we arrived a year ago, I found Kaffir Lime Leaves. Yeh, I know, it’s a bit sad and geeky but hey we’re foodies!! Finally I can buy rice wine vinegar, five-spice, a bamboo steamer and kaffir lime leaves! So these might seem small fish to you, wherever you’re reading this from, but since we moved to Lyon in June 2015 we haven’t been able to buy many staple ingredients for our pantry. French supermarkets are.. how shall we say it… traditional! Boring would also be one way of describing it and limited would be another. Yup, we’ve really struggled to buy Asian food and we’ve previously resorted to buying food off eBay and having it shipped over. Madness! Now I don’t have to and I’m happy. So, where’s the door then? Yeh, jury’s out on that one. I didn’t manage to find the Chinese Gate and so I am not sure if it even exists!